The "Morning Joe" co-hosts said "I do" over the long holiday weekend. It's official! Joe Scarborough and Mika Brzezinski aren't just "Morning Joe" co-hosts anymore — they're also husband and wife. A spokesperson for the duo confirmed the happy news to TODAY. The small event took place in Washington, at an especially fitting location for the former congressman and Brzezinski — the National Archives, with the Constitution, the Bill of Rights and the Declaration of Independence serving as a backdrop to the ceremony. The pair's "Morning Joe" pal — and our very own Sunday TODAY anchor — Willie Geist wasn't able to attend (due to some "very early morning television" the next day), but he spoke about the wedding on the show Monday. "Joe and Mika are off today and this week. Why, you ask? They had a very busy weekend," he stated early in the broadcast, before sharing a few details with viewers. "Joe and Mika were surrounded by all of their children, which made it very special for them." In addition to Scarborough's four kids and her two, all from previous marriages, family from both sides and a small group of close friends gathered together to witness their union. "We wanted it to be really small and simple and not what you expected from Mika and Joe," the bride, who wore a white midi-length dress covered in a sheer polka-dot lace, told Vanity Fair Saturday. "Everything we do is exposed, and everything felt exposed every step of the way, so we want this to be private until it’s over. We wanted to recognize it more quietly and have the people who are most important to us around us." Keeping the guest list short was just one way they assured the event would remain a secret ahead of time. They shared with the publication that the invitations were extended via phone calls rather than hard copies, the reservations were made under the name of a friend and the Thanksgiving weekend date was selected for the rare hubbub-free time it brings to Washington. Scarborough added, "We made the decision a year ago to dramatically change our lives and have a low-key existence. The more time we can spend with our family, the happier we are." And they were clearly happy on Saturday — as were those in attendance. Scarborough's former House colleague, Rep. Elijah Cummings, officiated the wedding, and he later tweeted that "it was a pleasure" to do so. Congratulations to Mika Brzezinski and Joe Scarborough! It was a pleasure to officiate your beautiful wedding. I wish you years of love and happiness together! Shortly after the nuptials, rather than sharing a wedding pic, Brzezinski took to Instagram with a photo of her holding a small amphibian and puckering up. In the caption, she simply wrote, "I kissed the frog." 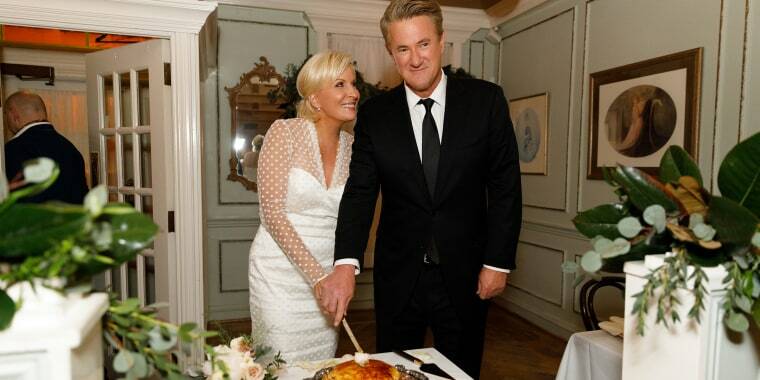 This marriage marks the third for Scarborough, 55, and second for Brzezinski, 51. They've worked side-by-side on "Morning Joe" for more than 11 years and announced their engagement last spring.